Google Expeditions VR – An expedition of the Jiuzhaigou National Park (Associated TES Lesson Plan). Google Expeditions AR – DaVinci’s inventions. Google Jamboard – Use Google Jamboard and the Jamboard app to Design a ‘be kind’ policy for your school. 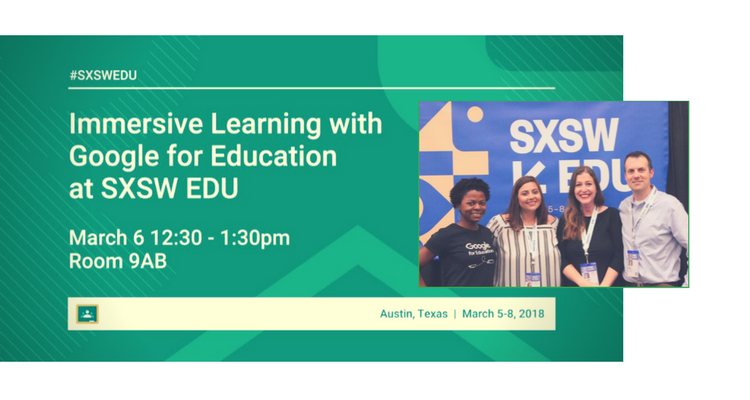 The panel shared their favorite technologies, including the immersive technologies in the stations and G Suite apps, and edtech apps such as Thinglink and Kahoot!. I shared that Google Classroom and Google Jamboard are two of my favorites because within 30 seconds of watching YouTube videos about them I could envision how I would use them with students. Ope asked me about the best uses of digital breakouts in the classroom. I replied that teachers can make them using response validation in Google Forms to help prepare students for a cumulative assessment at the end of a unit. Teachers can try smaller scale digital breakouts as exit tickets or help students learn vocabulary. The Google team used Google Classroom to both facilitate the pre-panel stations and collect participants’ thoughts on what they would like to use with their students. My favorite response in the classroom was from a participant who wrote, “I’m already writing an email to our system admin [to enable Jamboard]! Thank you to the team at Google for Education for inviting me to be part of the panel. It was an honor to be included in the company of innovative, passionate educators such as Carolina, Melissa, and Ope. What do you think of when you think of immersive learning with G Suite and other edtech? Please share in the comments below or tweet me, @TomEMullaney. Thanks for reading. I used this graphic and this photo from the @GoogleForEDU Twitter handle to make the image for this post.